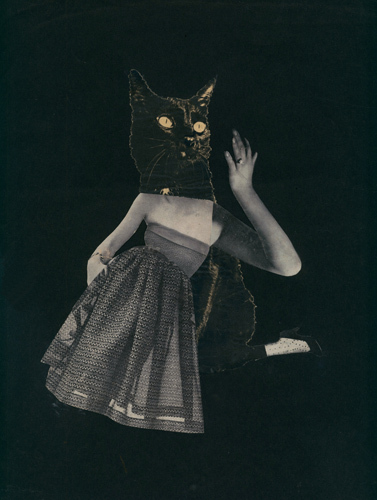 Toshiko Okanoue, Mask, 1952, collage, 16 1/4 x 12 3/8". A white-gloved hand is daintily poised to drop a tiny head into an open purse. Nearby, a blonde without a body gazes out from a lamppost, mouth half open, as if in midconversation. Set in the gray light of dawn, or maybe in the deepening glow of evening, between the darkened shadows of two buildings, the scene is just one of eleven black-and-white photographic collages by Toshiko Okanoue on view in this exhibition; each consists of an equally delicate and surreal depiction of an eerily familiar but impossible tableau. Okanoue made these collages between 1950 and 1956, just after the devastation of World War II. Composed of photographs from Life and fashion magazines, the works feature dreamlike vistas and idiosyncratic humor in line with what was at the time a relatively new language for art. Surrealism hasn’t been in vogue for a while now, yet Okanoue’s output has a timeless sensibility—like an older, lesser-known cousin to contemporary collages, such as the notable output of Marnie Weber and Wangechi Mutu. In 1953, Okanoue was granted a one-woman show at Takemiya Gallery in Tokyo. Not long after that, she married painter Fujino Kazutomo and stopped making and showing art. But the results of her brief and productive period during the early ’50s have survived the silence of decades—Okanoue’s work has not been on public view in more than half a century, save a solo exhibition in 2000 at Dai-Ichi Mutual Insurance South Gallery in Tokyo—and richly deserve renewed attention.